So October included a Car vs. Bike Rack showdown. The bike rack won, suffering minimal damage while somehow ripping up our car to the tune of over $2,2oo and over a week in the body shop. We do have decent car insurance, but we are still out the $1k deductible. And after the catastrophe last year with the same car, I’m assuming our insurance rates will go up any time now. The silver lining of the situation is that we have been functioning just fine as a 1-car family. That was one of our goals in moving to this part of town – not to get rid of a car necessarily, but to be able to if we wanted to. And now we know we can! Huzzah! Now let’s move on to our other October spending. A quick reminder: these spending reports are an effort to keep myself accountable to the idea that doctors do not have to spend a totally ridiculous amount of money to live well and love life. We’re planning to do these spending reports through the end of 2018. As I have mentioned before, we do not do traditional budgeting. You absolutely should do traditional budgeting if that works for you as a way to control your spending. More on this topic here. 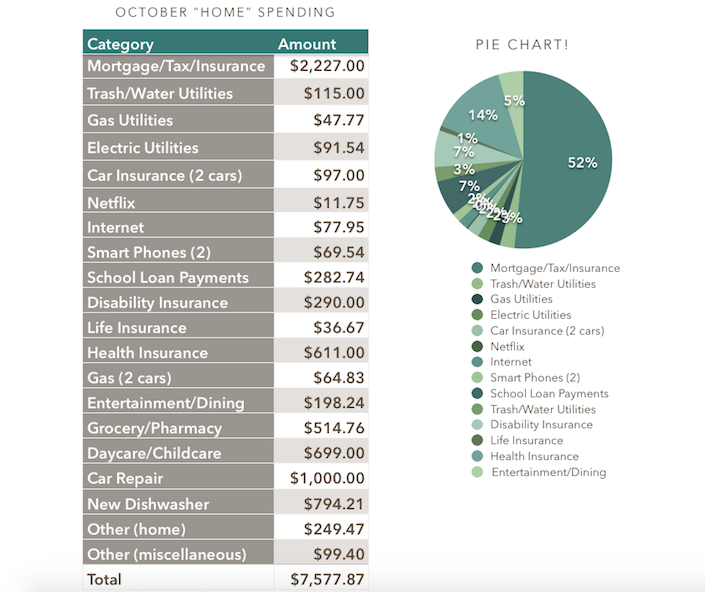 We didn’t have much in the way of major expenses in October, other than the above-mentioned car annoyance. We did a lot of hiking and other being-outdoors-enjoying-fall activities. We are limping toward breaking ground on a new investment property, which is taking up a fair amount of our time. Details forthcoming as soon as it’s official. If you’re interested, you can check out our spending reports for January, February, March, April, May, June, July, August, and September. June’s report contains totals for the half-year mark. Our total spending for the first 3 quarters of 2018 (January-September) was $55,047.20. -I have not included our charitable giving here, which can be a very sensitive subject for a lot of people (especially those who feel like they are drowning in debt). But unless you yourself are about to starve or freeze to death due to lack of basic resources, I recommend you find at least one charitable organization you are really excited about and send them monthly donations via auto-draft, even if it’s a small amount. Many charities desperately need people who can commit to monthly financial support. -This list does not include our HSA, stock investments, or our real estate investments. I am planning to write more about how we approach our savings and investments at some point. -This list does not include business loan payments, professional dues, licensing fees, malpractice insurance, or other expenses that are due exclusively to our business ownership and – unlike my student loans – would go away if I sold the business and switched careers. -The student loan payment shown here is what’s on auto-draft. You can read here about how we are paying extra on our loans every month in an effort to be done with them this year. I include student loans in “home” spending even though they are related to my career because they don’t go away no matter what I do career-wise. -We have health insurance and an HSA though my husband’s work as a teacher, both of which are deducted directly from his paycheck. It’s actually a pretty great deal, all things considered. We pay out of pocket for dental care and eye care services as needed. -All “Entertainment/Dining” expenses are 100% optional expenses. For us, these tend to be things like going to the movies and eating at Chick-fil-A. -I include life and disability insurance in this list even though they are sort of related to work, because they are what protect our current lifestyle. My disability insurance is expensive because it is important to us to be able to pay off all our debts and live well even if I am unable to work. -“Groceries” includes food, household items, medications, and toiletries purchased at Sam’s Club or grocery stores or Walgreens. -This list does not include at-home babysitters, who we very occasionally (usually less than once a month) pay in cash to watch our kids when Grandma isn’t available (Grandmas are the best!!!). Any at-home babysitters we pay are non-essential, although very much appreciated. The daycare/childcare shown is what we pay for while we are both at work (which is very much essential as long as we both want to work) and is listed under “Daycare/Childcare”. Not our most spendy month and not our most efficient month this year. If we had not shredded part of our car or grown weary of our old dishwasher (which was loud but fully functional and has now been donated to Habitat for Humanity), October’s total would have been $5,783.66. Important note: even though our mortgage is a HUGE percentage of our spending this month – and most months for the foreseeable future, actually – it is far less than that if looked at as a percentage of our income. I would not recommend anyone spend close to half of their net income on a mortgage, ever. If you’re not in a position to take on a mortgage, remember that there is nothing wrong with renting or having roommates! Our total spending for the year is now up to $62,625.07. Unless something really crazy happens, we’re expecting our total 2018 spending to come in just shy of $80k, for our family of 4 in this high COL town, including our trips all over the U.S. as well as our upcoming trips to the Bahamas and Switzerland.